Yesterday I attended the first critique session of the NYC writers group that I joined late last month. A longstanding group member, who I will call TS, had shared two chapters of a romance story. I read the story twice and decided to make “big picture” comments, which is what I tend to notice when giving feedback. This is one of the reasons that being an editor has appeal for me. Approximately 30 people showed up today to give TS feedback on the story. We started by stating our names, our preferred genres, and our writing goals. At least five people said that their goal was to “finish something” by the end of the year. I was so happy to hear that I am not alone. Each person had two minutes to give one positive and one constructive comment to the writer. In addition to the written feedback that each person contributed, TS wrote as she heard our feedback. A few pauses were needed. Almost everyone kept under the two minutes. And then the floor was opened up for discussion. Wooo-whee!! Was that ever intense!? And I’m not even the writer! I was surprised at how many people, including myself, felt so passionately about making TS’s story work. TS did a great job of explaining her reasons. The story and characters are well rounded, for the most part, and the dialog worked very well. Two intense hours later, the session finished. I was a bit worried that I would be in tears when my time to share came. However, I left with somewhat excited feeling that I have a lot of work to do on my Butterfly Wings rom-com story that I wrote for NaNoWriMo 2008. BW is my “to do” that needs to become “to done” for 2014. Writing can be improved. Dialog can be made believable. Characters can be flawed human beings without being too stiff or stereotypical. I can see that, in the frenzy of writing 50,000 words for NaNoWriMo, a lot of extra words made their way into the story as I was figuring out where to go with it. I have to keep trying. To keep trying is to keep writing is to keep improving is to keep living. I can not imagine my life without writing being a part of it, whether it is this blog, fiction, or in a journal. Obtained 2 tickets on pre-sale to see Eddie Izzard at the Beacon Theater in NYC on May 14, 2014 for his Force Majeure tour. Next steps: Squee!! Rewatch past tours and bits of tours. Cake or Death. Death Star Canteen. Covered in bees. Over and over. 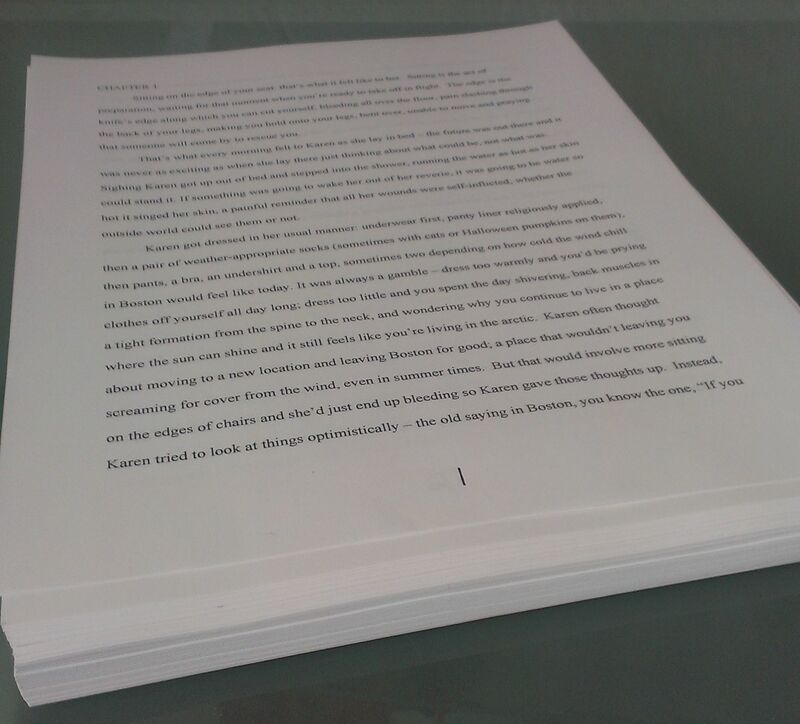 Completed turning my 156-page story into a lean 22-page outline. Next steps: group my lists into scenes that I can shuffle and/or cut from. Read through 138-pages of an amazing 500 page HTML+CSS visual textbook. I have already learned some basic HTML+CSS, so this is for review and continued learning. Next steps: Complete the HTML section. Survived 3 hours at the Starbucks After-School Program with headphones. Next steps: Visit a list of NYC coffeehouses tomorrow until Mark can meet me for a birthday dinner. Participated in an interactive online webinar about how to edit a story. Ordered an editing book so I can get a 20-minute free consult from The Book Doctors. That’s gotta be dead useful. Next steps: Wait for book to arrive so I can apply their advice to my story. Listened to my friend Jack’s incredible Goth Industrial radio program on WKFU for only 1/2 hr. out of 2hrs. because of webinar. Next steps: Look forward until next week when I can listen to his program for 2 hours. Completed this my 26th daily post so I can keep my promise to myself to blog every day. Next steps: Go to sleep. Wake up tomorrow. Blog all over again. Tonight, I have a list. Tomorrow, I have a plan. Tune in tomorrow to find out!